At Career Development Services we place a huge emphasis on making sure the ‘best job fit’ first time by carefully matching the role with the candidate. In many cases, people’s strengths are not being maximized nor is the job role clearly defined. This is not helpful for your business nor for the individuals involved. But it very definitely needn’t be like this. Competent, committed staff are key to your company’s success. We can help you match the requirements of each job with the unique attributes of each individual. Research has shown consistently the value of matching the right people with the right role. Clients who work with us are concerned about matching the right person with the right job. For them that means that the person they are employing or redeploying is motivated to get the job done, is suited to their culture and ethos while obtaining optimum job satisfaction from his/her role. Many clients have incurred losses on average between €25K and €200K in financial costs alone not to mention the wastage in time, mental anxiety and the trauma of unfair dismissal by not spending the time and effort in matching the right person to the right role from the start. Have you experienced similar circumstances? What we do in CDS is to work with you to ensure that you do not make those costly mistakes. Together, we objectively evaluate and then match the very best people for the role, using their work style and their competency level to suit your requirements in a fair and accurate manner. Step 1: Job clarification. Right from the start through an indepth job analysis we help you to define, measure, prioritise the behavioural characteristics you are requiring from the individual to be successful in the job role. You may be looking for someone who can work on their own initiative in a fast paced environment making many social contacts or you may be looking for someone who would prefer to work alone and is capable of getting on with their work in a planned and methodical manner. You may need to determine what potential is called for in the job or the level of complexity and competency that is required of the employee. Step 2: Clarification of the individual’s strengths and weaknesses obtained through person questionnaire and an individualised person feedback. Step 3: Only then can a match be made between the individual and the job profile. The match will highlight where the individual’s strengths lie, what challenges s/he may encounter, what precise training or help they may need. You will know precisely how they will approach a work assignment and indeed how they will interact with other people. You will know what will motivate the individual and conversely what would typically annoy them. The benefits of the Job and Person Match are enormous for you when recruiting as it creates the foundation for an objective Interview where these questions can be subsequently explored and verified. You may have a situation where an existing team is not working. Or you may be thinking of putting a team together for a specific project. What we do in CDS is to assist you in building the most productive team by measuring each individual’s specific team role and the strengths and contribution each individual’s role brings to the team and how s/he interacts with other team members. We identify for you the overall team composition revealing their skill set and team competencies, where there is a deficit of key team roles or where the team lacks a functional skill and what that costs the team in terms of outputs. The bottom line is that a heightened awareness of the dynamics, strengths and weaknesses of your team improves communication, encourages discussion on better ways of working together, increases respect and harmony within the team and determines the type of training or development required to become a productive team. In short, it’s about maximising the performance of your team. Click here to contact us if you would like to know more. What is meant by effective communication? Do you ever find that when you give an instruction to one of your members of staff what you get back is completely different to what you expected them to do? Or have you ever walked into the office of one of your managers with a great visionary idea only to be greeted with complete negativity lack of enthusiasm or a reaction you were least expecting. Have you ever found how easy it is to relate to some customers or clients yet fail miserably to get through to others? People communicate in different ways. The trick is knowing the different ways of communication and how people interact. What we do in CDS is to help you understand your communication style, evaluate how you communicate and the impact it has on others. We help you to learn other communication styles and their impact. By knowing how other people think and behave, you’re in a stronger position to get the best out of them . The bottom line is that with an increase awareness of communication styles, you will deal with people easier and better. You will have less stress, better relationships and people will get on better together. By not having a method of effective communications you’re losing not just money but time, relationships, clients/customers. When was the last time you had a career conversation with your employees? If you never had or even considered a career conversation, then the chances are that your employees are one of the two thirds of Irish men and women who are unhappy in their current roles. According to research carried out by Accenture in March 2012, 62% of Irish women were unhappy in their jobs compared with 57% of women globally and 62% of Irish men were unhappy in their jobs compared to 59% globally. Have you considered the cost consequence of this? Many organisations both large and small have called on our career guidance expertise to help them with them with their talent development. 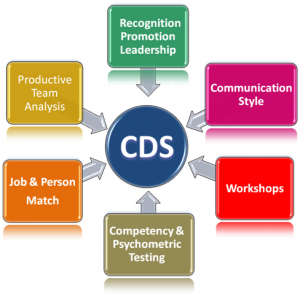 What we do in CDS is to help you to acquire essential knowledge about your employees knowing not only what their existing skills and aptitudes are but also being able to predict their potential to develop and acquire new knowledge. The steps we take can range from simple one to one conversations to more in-depth assessments. In our 20 years of experience, our findings are revealing. You may for example think that the only means of promotion is upwards. More often than not, we have found that employees value being challenged, growing their skills, having new experiences, or even being listened to as far more rewarding than just the possibility of going up the career ladder. For instance, have you ever promoted somebody above their ability? What difference did it make? Were they over-challenged? Were you constantly giving support? Did they eventually suffer from stress and burn out? With the right career guidance, maybe job satisfaction for them would be realignment, the opportunity to get back to the job they loved before they got promoted. Maybe moving sideways to gain more skills, or a change in job but not necessarily a change in the level of responsibility is what is called for. Maybe you have untapped talent. Take Leadership. Have you ever noticed that some members of your staff are always coming up with good ideas, new thoughts and are quick to evaluate a situation seeing both sides to a problem and being able to draw conclusions in order to solve it quickly? They may not be in a senior position but they love to analyse a situation extract information from numerous sources either from themselves, from other or course/training they maybe on. They can adapt quickly to change. Are you training the right people to take up leadership roles?. Are you maximising your employees’ potential in all areas? When you are recruiting either internally or externally, do you consider a person’s current knowledge, experience and skills only or do you consider what his or her future potential for learning or development maybe? What might s/he be able to do for you years from now? This is where we can assist you: To analyse correctly the complexity of the job ensuring that it is at the right level for the employee, to explore options for your employees to grow, identify barriers preventing them from performing to their potential. If in management, the management style that is effective for a specific role. Maybe the role is calling for a development oriented manager, or a personnel focused manager, or maybe a manager whose emphasis should be more on administration. We help you to evaluate the behavioural traits of your managers, department heads or group leaders so that you can ascertain precisely where they can best apply their energy. Development Feedback is vital whatever the level. We give one to one feedback to help employees reflect on their strengths, or areas they need to develop or progress. It is future-oriented and focused. With our help you will know what potential is called for now, or in the future. Having people on your payroll who are dissatisfied with their job is NOT a natural condition, or “something that goes with the territory”. With the right advice and guidance, you can correctly identify how you can match the passions and the aptitudes of your staff – and how you match those with the demands of the role. The bottom line is that satisfied employees who are on a continuous path of growing, developing and adding new skills are productive well motivated employees helping you to keep the competitive edge. Rewarding good people keeps them. We provide a range of training workshops designed to improve the performance and business skills of your workforce and enhance organisational development. These can be off the shelf training workshops or bespoke and tailored to suit the specific needs of your organisation. Please contact us to discuss your requirements. Click here to contact us. As an employer you may see the value of using psychometric tests at the recruitment stage because of the extra insight they give in terms of a person’s thinking style, his/her drivers and motivations, leadership techniques and whether s/he will make good team players and are easy to manage. However, beyond the recruitment stage, have you ever said to yourself what on earth can a psychometric test tell me that I don’t know already about my employees. They are a complete waste of my time and money. Why then do 75% of the Times top 100 companies in UK use psychometric testing? Have you ever lost an employee because you did not recognise his/her true potential? Having as much knowledge about your employees will clearly maximize your success in retaining and developing your talent. What we do in CDS is to help you develop your talent from within long after the recruitment stage. Using a range of psychometric aptitude and competency tests, we assess individuals, give feedback to them and report back to you on their level of ability and their proficiencies or potential to develop and acquire new knowledge. You can determine in a more objective way who you can develop, how you can enhance their skills’ level or identify potential leaders and predict job performance to improve productivity. The bottom line is that keeping your employees on a continual path of growing, developing and adding new skills will help you keep your competitive edge.